To seek high signal-to-noise ratio (SNR) is critical but challenging for single-shot intense terahertz (THz) coherent detection. This paper presents an improved common-path spectral interferometer for single-shot THz detection with a single chirped pulse as the probe for THz electro-optic (EO) sampling. Here, the spectral interference occurs between the two orthogonal polarization components with a required relative time delay generated with only a birefringent plate after the EO sensor. Our experiments show that this interferometer can effectively suppress the noise usually suffered in a non-common-path interferometer. The measured single-shot SNR is up to 88.85, and the measured THz waveforms are independent of the orientation of the used ZnTe EO sensor, so it is easy to operate and the results are more reliable. These features mean that the interferometer is quite qualified for applications where strong THz pulses, usually with single-shot or low repetition rate, are indispensable. X. Zhang, A. Shkurinov, and Y. Zhang, “Extreme terahertz science,” Nat. 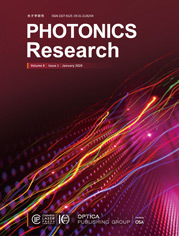 Photonics 11, 16–18 (2017). D. M. Mittleman, M. Gupta, R. Neelamani, R. G. Baraniuk, J. V. Rudd, and M. Koch, “Recent advances in terahertz imaging,” Appl. Phys. B 68, 1085–1094 (1999). Z. Jiang, F. G. Sun, Q. Chen, and X. Zhang, “Electro-optic sampling near zero optical transmission point,” Appl. Phys. Lett. 74, 1191–1193 (1999). X. Pan, Y. Cai, X. Zeng, X. Lu, D. Zhang, J. Li, H. Chen, and S. Xu, “Modified THz electro-optic sampling for high optical modulation depth, large dynamical range and low background noises,” Opt. Lett. 39, 3778–3781 (2014). G. Sharma, K. Singh, I. Al-Naib, R. Morandotti, and T. Ozaki, “Terahertz detection using spectral domain interferometry,” Opt. Lett. 37, 4338–4340 (2012). M. Teo Stephanie, K. Ofori-Okai Benjamin, A. Werley Christopher, and A. Nelson Keith, “Single-shot THz detection techniques optimized for multidimensional THz spectroscopy,” Rev. Sci. Instrum. 86, 051301 (2015). Z. Jiang and X. Zhang, “Electro-optic measurement of THz field pulses with a chirped optical beam,” Appl. Phys. Lett. 72, 1945–1947 (1998). G. P. Wakeham and K. A. Nelson, “Dual-echelon single-shot femtosecond spectroscopy,” Opt. Lett. 25, 505–507 (2000). K. Y. Kim, B. Yellampalle, A. J. Taylor, G. Rodriguez, and J. H. Glownia, “Single-shot terahertz pulse characterization via two-dimensional electro-optic imaging with dual echelons,” Opt. Lett. 32, 1968–1970 (2007). J. Shan, A. S. Weling, E. Knoesel, L. Bartels, M. Bonn, A. Nahata, G. A. Reider, and T. F. Heinz, “Single-shot measurement of terahertz electromagnetic pulses by use of electro-optic sampling,” Opt. Lett. 25, 426–428 (2000). Y. Kawada, T. Yasuda, A. Nakanishi, K. Akiyama, and H. Takahashi, “Single-shot terahertz spectroscopy using pulse-front tilting of an ultra-short probe pulse,” Opt. Express 19, 11228–11235 (2011). F. D. J. Brunner, J. A. Johnson, S. Grübel, A. Ferrer, S. L. Johnson, and T. Feurer, “Distortion-free enhancement of terahertz signals measured by electro-optic sampling. I. Theory,” J. Opt. Soc. Am. B 31, 904–910 (2014). J. A. Johnson, F. D. J. Brunner, S. Grübel, A. Ferrer, S. L. Johnson, and T. Feurer, “Distortion-free enhancement of terahertz signals measured by electro-optic sampling. II. Experiment,” J. Opt. Soc. Am. B 31, 1035–1040 (2014). S. P. Jamison, A. M. Macleod, W. A. Gillespie, and D. A. Jaroszynski, “High-temporal-resolution, single-shot characterization of terahertz pulses,” Opt. Lett. 28, 1710–1712 (2003). Z. Jin, A. Wada, J. H. Shin, N. Yugami, and R. Kodama, “A single-shot terahertz time-domain,” J. Phys. Conf. Ser. 688, 012040 (2016). N. H. Matlis, G. R. Plateau, J. V. Tilborg, and W. P. Leemans, “Single shot spatiotemporal measurements of ultrashort THz waveforms using temporal electric-field cross correlation,” J. Opt. Soc. Am. B 28, 23–27 (2011). A. Ibrahim, G. Sharma, K. Singh, and T. Ozaki, “Terahertz detection based on spectral-domain interferometry using Mach-Zehnder interferometer,” J. Infrared Millimeter Terahertz Waves 37, 837–845 (2016). G. Sharma, K. Singh, A. Ibrahim, I. Al-Naib, R. Morandotti, F. Vidal, and T. Ozaki, “Self-referenced spectral domain interferometry for improved signal-to-noise measurement of terahertz radiation,” Opt. Lett. 38, 2705–2707 (2013). S. Zheng, X. Pan, Y. Cai, Q. Lin, Y. Li, S. Xu, J. Li, and D. Fan, “Common-path spectral interferometry for single-shot terahertz optics-electro detection,” Opt. Lett. 42, 4263–4266 (2017). J. Hebling, K. Yeh, M. Hoffmann, B. Bartal, and K. Nelson, “Generation of high-power terahertz pulses by tilted-pulse-front excitation and their application possibilities,” J. Opt. Soc. Am. B. 25, B6–B19 (2008). S. Zheng, Y. Cai, X. Pan, X. Zeng, J. Li, Y. Li, T. Zhu, Q. Lin, and S. Xu, “Two-step phase-shifting SPIDER,” Sci. Rep. 6, 33837 (2016). P. C. M. Planken, H. K. Nienhuys, H. J. Bakker, and T. Wenckebach, “Measurement and calculation of the orientation dependence of terahertz pulse detection in ZnTe,” J. Opt. Soc. Am. B 18, 313–317 (2001). Fig. 1. Experimental setup. S, sampler; M1∼M3, mirrors; L1, 2, lenses; EOC, ⟨110⟩ ZnTe EO crystal; Si, silica wafer; BS1, 2, beam splitters; OAPM, off-axial parabolic mirror; SPIDER, spectral phase interferometer for direct electrical field reconstruction; P, polarizer. Fig. 2. Geometry of THz EO detection based on ⟨110⟩ ZnTe crystal. The plane of the page is the (110) plane of the crystal, and the angles α and θ are measured inside the (110) plane. Fig. 3. Dependences of the phases induced by THz field on azimuthal angle α with (a) improved CP-SI and (b) MZ-SI. Fig. 4. Measured waveforms of THz fields for different α values with the α-BBO plate (a) after and (b) in front of the EOC. Fig. 5. (a) Normalized THz waveforms measured by three methods: traditional multi-shot scan (black line), SE-EOS averaging over 100 shots (red line), and improved CP-SI (blue line); (b) the recorded THz field noises by using improved CP-SI (gray area) and the RMS statistics over 100 shots (blue line). Fig. 6. (a) Normalized THz waveforms measured by traditional multi-shot scan (black line) and MZ-SI (blue line); (b) the recorded THz field noises by using MZ-SI (gray area) and the RMS statistics (blue line). (4) φ2=2πLλ(Δny′′ cos2 γ+Δnz′′ sin2 γ). (6) Δny′′=n32ETHz(t+τ)r41[cos α sin2 θ+cos(α+2θ)].